Biplab Kumar Deb would be in charge of seven departments including home, PWD, industries and commerce. 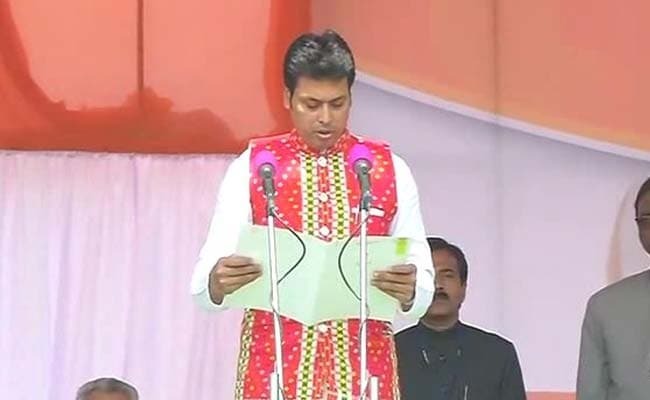 Agartala: Biplab Kumar Deb, who assumed the office of Tripura chief minister yesterday, allocated portfolios to all the nine ministers sworn-in, including himself, today. Chief Secretary Sanjeev Ranjan, in a notification, said Mr Deb would be in charge of seven departments - home, PWD, industries and commerce, urban development, general administration, labour, information and cultural affairs - apart from being responsible for all the policies and any other department not allocated to any minister. Mr Deb, however, would not be looking after the Information Technology (IT) sector in the industries and commerce department, the notification said. Deputy Chief Minister Jishnu Devvarma, who is yet to win an election from an Assembly seat, was given the portfolios of power, rural development, finance, planning and coordination. Ratan Lal Nath was given the charge of school education, higher education, law, parliamentary affairs, welfare of OBCs and minority portfolios. Sudip Roy Barman, who had joined the BJP with five other Trinamool Congress (TMC) MLAs last year, was given the portfolios of health and family welfare, industries and commerce (IT), science, technology and environment and drinking water supply. Pranajit Singha Roy was given the agriculture, transport and tourism portfolios. Manoj Kanti Deb was given the charge of the department of youth affairs and sports, apart from food, civil supplies and consumer affairs. Indigenous People's Front of Tripura (IPFT) president and veteran leader N C Debbarma was given the revenue and fishery portfolios, while IPFT general secretary Mevar Kumar Jamatia was given the tribal welfare and forest portfolios. Shantana Chakma, the youngest minister and the only woman in the new government, was given the social welfare and social education portfolio as well as animal resource development.